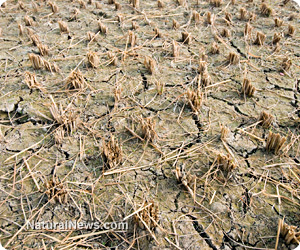 (NaturalNews) The fruit basket of America, California's Central Valley, is in major trouble. Persistent drought conditions combined with decades of overfarming and chemical spraying has killed much of the growing acreage there. And experts are now warning that the entire agricultural region will likely collapse if more farmers don't give the land a chance to rest and rejuvenate itself. Ever since early farmers first began diverting water from across the state into the valley, which is technically a desert, the viability of the land there has been on a slow crash-course toward collapse. Irrigation-based crop systems, it turns out, which dominate the San Joaquin Valley where some 1.75 million acres of farmland exist, leach toxins, salts and other substances out of the ground, where they build up over time. If you're wondering why this is a big deal, consider that the Central Valley provides more than 25 percent of the nation's food, including nearly half of the tree fruits, nuts, table grapes, and wine grapes that stock your local supermarket. The Central Valley is also a critical producer of cereal grains, hay, cotton, tomatoes vegetables, and citrus, according to data provided by the U.S. Geological Survey (USGS). Of particular concern is the continued destruction of native habitats to make way for more large-scale farms, residential housing and other developments in the area. Without the natural plants, animals, insects and other life that flourished in the valley before it was transformed into a multimillion-acre network of industrial agriculture plantations, the growing soils simply cannot be sustained. "We can make the decision now, when we actually have the choice about how to rationally back out of that bad situation and make landowners whole," said Jon Rosenfield, a conservation biologist for the environmental group Bay Institute who is calling for many more landowners in the area to retire their fields and restore them back to native habitat for restoration. "Or we can just wait until the worst is upon us, we've driven the species extinct, we've plowed under the last bit of naturalized landscape in the area, and then we're going to retire these lands anyway," he adds, as quoted by the San Francisco Gate. Some area farmers have already sold off their land, including Jack Mitchell, a 74-year-old retired farmer who used to cultivate many thousands of acres. The federal government purchased some 3,000 acres of Mitchell's to study the damage caused, as well as initiated a restoration program to bring birds, mammals, plants and other wildlife back to the land. "We could see the writing on the wall," stated Mitchell to SFGate, noting that the drainage system for irrigation was always less than desirable. In fact, much of the western side of the valley where Mitchell's former land is located is plagued by poor drainage. This is made worse by the fact that land in the valley is set atop an impermeable clay layer known as Corcoran, which further traps irrigation water that has already collected heavy amounts of salt, boron, selenium and other minerals that are poisoning the soil. The unfortunate reality is that there is nowhere for all this irrigation waste to go, which means it is continuing to pile up in the valley with no end in sight. The only option, say environmental experts knowledgeable about the situation, is for farmers to either move their crops elsewhere or simply stop growing them altogether.